We naturally have sugar in the bloodstream that provides energy to every body cell. Healthy levels of this sugar, glucose, are maintained by insulin, a hormone secreted when blood sugar rises too high. Type 2 diabetes happens when your body doesn’t make enough insulin or your body’s cells don’t respond normally to insulin, called insulin resistance. This causes high blood sugar and immediately starts to starve cells of energy. Over time, high blood sugar damages sensitive tissues, such as those in the extremities, eyes, and kidneys. Following a regular meal plan, being active, taking medications, and tracking your blood sugar levels will help you manage your diabetes. Indeed, you may be able to control your diabetes just by eating healthfully and exercising regularly. Most people benefit from 3 meals plus 2 to 3 snacks every day. For easy snacking ideas, click here. Carbohydrates provide energy, and every cell needs energy. Carbohydrates are found in fruits, vegetables, grains, nuts, seeds, beans, and dairy and come in three forms, sugars, starches, and fiber. Sugars are the simplest, most easily absorbed carbohydrates and include glucose needed to sustain energy. Starches are longer chains of sugars. Fiber is the indigestible part of a plant. While it is generally not digested, it may offer cardiovascular and digestive benefits. Everyone’s digestive system needs carbohydrates, and it is best to balance them with fiber, protein, or fat at every meal. Balancing carbohydrates decreases the rate of absorption of glucose, so your blood sugar won’t spike as dramatically. Good carbohydrate choices are those that already contain these nutrients, such as fiber-rich fruits and vegetables. Pears pack a nutritional punch! 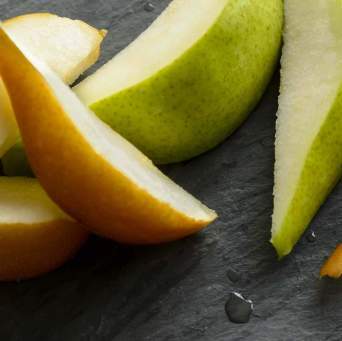 Each medium pear contains 6g of fiber, 24% of the recommended daily value, and they are a good source of vitamin C. Eating two pears every day meets your fruit needs as outlined by the Dietary Guidelines for Americans. What could be sweeter? But Doesn’t Fruit Contain Sugar? Sometimes people think that since fruit naturally contains sugar, eating fruit is not appropriate for managing diabetes. This is not true! Fruit is full of vitamins, minerals, water, and fiber – all important nutrients – and most fruits are considered low GI foods. Indeed, foods high in fiber, such as pears, taste sweet without having the deleterious effect of spiking blood sugar. For those counting carbohydrates, a small piece of fruit contains about 15g, or one serving, of carbohydrates. For more information on including fruit in your diet, visit the American Diabetes Association website.